WASHINGTON, D.C. — Astronomers have for the first time traced gamma rays, the most energetic form of light, to galaxies undergoing a frenzy of star birth. The finding, which has revealed a new class of galactic gamma-ray sources, is not unexpected. But it provides new hints about the origin of many cosmic rays, the high-speed protons and other charged particles of extraordinarily high energies that bombard Earth. sciencenewsAccording to the prevailing theory, cosmic rays are accelerated to energies of billions to trillions of electron volts by the expanding shock waves generated when massive stars explode as supernovas. (Cosmic rays with even higher energies are thought to be powered by supermassive black holes at the centers of galaxies.) Kinks in a galaxy’s magnetic field keep the particles, mainly protons and other charged particles, bouncing back and forth like ping-pong balls between the advancing shock wave and the region just in front of it, revving up the particles to these high energies, the model suggests. Massive stars live for only a few million years before exploding — an eyeblink in astronomical terms. Galaxies that produce lots of newborn stars therefore have lots of dying stars that explode as supernovas and ought to have an abundance of cosmic rays. Testing the theory that supernova shock waves generate cosmic rays hasn’t been easy, however, because galactic magnetic fields bend the direction of travel of all charged particles, including cosmic rays, preventing astronomers from tracing any but the highest energy particles — which can escape the magnetic fields — back to their home galaxies. But when cosmic rays collide with other atomic nuclei in surrounding gas or dust, they produce gamma rays, the most energetic form of light. And unlike charged particles, light can’t be bent by magnetic fields. mb2veritasA new generation of gamma-ray telescopes, including the Fermi Gamma-ray Space Telescope launched in 2008, and VERITAS, an array of four 12-meter telescopes atop Mount Hopkins in Arizona, has now succeeded in detecting gamma rays from three galaxies undergoing intense waves of starbirth. The finding helps to confirm the connection between supernovas and cosmic rays. Researchers reported the findings November 2 at the 2009 Fermi Symposium (named for the Fermi Gamma-ray telescope, the main focus of the conference). VERITAS observed gamma rays ranging from 700 billion eV to several trillion eV from the galaxy M82, which is some 12 million light-years from Earth. 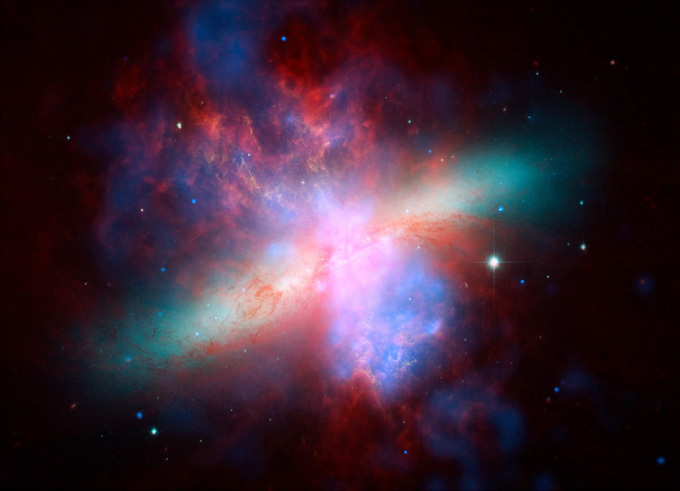 M82 is classified as a starburst galaxy because within a small, central region it makes stars at a rate 10 times higher than that of the entire Milky Way. Although M82 is one of the closest starburst galaxies, “it took us two years of all-out observations of M82 to acquire all the necessary data,” said VERITAS researcher Wystan Benbowof the Smithsonian Astrophysical Observatory in Cambridge, Mass. Starburst galaxies produce a diffuse gamma-ray glow that is about one-millionth the brightness of galaxies that have active, supermassive black holes at their centers — the only type of galaxy from which gamma-ray telescopes had previously recorded emissions. Finding gamma rays in a starburst galaxy “had been long predicted, but nobody had ever done it before this year,” noted Benbow, whose team also reported the discovery online November 1 in Nature. The Fermi Gamma-ray Space Telescope, which records lower-energy gamma rays than does VERITAS, also found gammas from M82 and from another starburst galaxy, NGC 253, reported Keith Bechtolof the SLAC National Accelerator Laboratory in Menlo Park, Calif. In addition, Fermi recorded a diffuse gamma-ray glow from a region of intense star formation in the Large Magellanic Cloud, a small satellite galaxy of the Milky Way, said Jürgen Knödlseder of the Center for the Study of Space Radiation in Toulouse, France. The Large Magellanic Cloud is close enough to the Milky Way that Knödlseder and his colleagues could tell that the gamma rays emanated from a region that has highly ionized gas. Such sites are places where massive stars, which produce ionizing radiation, are expected to be common. The finding “implies that massive star-forming regions are the main source of cosmic rays in the Large Magellanic Cloud,” Knödlseder said. Bechtol noted that the two starburst galaxies, M82 and NGC 253, have a higher rate of supernova production and emit more gamma rays than the Large Magellanic Cloud, another clue that supernovas and cosmic rays are intrinsically linked. After hearing the news, “I didn’t fall out of my chair but I got a big smile on my face,” says theorist Brian Fields of the University of Illinois at Urbana-Champaign, who is not a member of either discovery team. Had Fermi and VERITAS not found gamma-ray emissions from starburst galaxies, he notes, “it would have been back to the drawing board” for understanding the origin of cosmic rays. Although the discoveries “bolster our confidence that cosmic rays are accelerated by supernova remnants,” they do not clinch the case, said gamma-ray theorist Charles Dermer of the Naval Research Laboratory in Washington, D.C., a member of the Fermi collaboration. The clincher may come, he says, if an ongoing analysis of Fermi data finds that gamma-ray emissions from starburst galaxies peak at an energy of 70 million eV. That corresponds to the energy generated when a subatomic particle called a neutral pion decays into two gamma rays. Because galactic pions can only be generated by cosmic-ray collisions, finding this peak would provide compelling proof for the theory, Dermer said.